Disney’s ALICE THROUGH THE LOOKING GLASS: Where Does The Time Go? Happy Daylight Savings! Did you remember to move the clocks ahead? I think almost all of ours do it automatically now (so you never know what time it REALLY is!). Disney’s ALICE THROUGH THE LOOKING GLASS has a fun new spot for us in honor of the time change. Take a look at the video below. 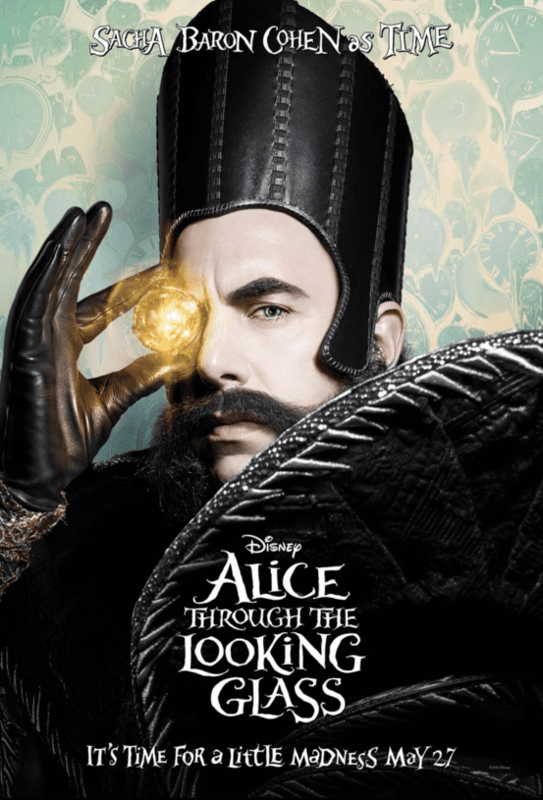 In Disney’s “Alice Through the Looking Glass,” an all-new spectacular adventure featuring the unforgettable characters from Lewis Carroll’s beloved stories, Alice returns to the whimsical world of Underland and travels back in time to save the Mad Hatter. ALICE THROUGH THE LOOKING GLASS reunites the all-star cast from the worldwide blockbuster phenomenon, including: Johnny Depp, Anne Hathaway, Mia Wasikowska and Helena Bonham Carter along with the voices of Alan Rickman, Stephen Fry, Michael Sheen and Timothy Spall. We are also introduced to several new characters: Zanik Hightopp (Rhys Ifans), the Mad Hatter’s father and Time himself (Sacha Baron Cohen), a peculiar creature who is part human, part clock. It’s going to be SO good! I have some new character posters for you, too. The talent in this movie is insane! You can stay up to speed with ALICE AND THE LOOKING GLASS by following along on Facebook, Twitter, and Instagram. I’ll keep you posted too! Disney’s ALICE AND THE LOOKING GLASS releases May 27, 2016!